Despite local differences and more than thirty living languages, the Maya share cultural roots and the common legacy of an accomplished civilization that peaked between 250 – 1200 CE. The term Maaya is a Yucatec Mayan language word that describes the language spoken by indigenous people in the Yucatán Peninsula, México. Western scholars have ascribed this term to all Maya people. 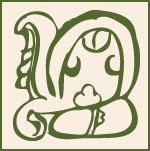 Maya culture is characterized by monumental architecture, by iconography and hieroglyphic writing, and by complex mathematical and astronomical systems. Knowledge of observational astronomy and sustainable agriculture still guide the daily activities of rural life in the Maya world. Rituals and ceremonies connected to their land and to their calendar are still practiced today. Maya people are active participants in the social fabric of an international world, and the legacy of their ancestors propels their culture forward.